Every time when we start doing, watching or using something, do we often seat and think about it from the origin side of this phenomenon? Whom we have to thank for it, whom to honor and or even whom to hate? Frankly speaking, not always, maybe better to say never. When once somebody starts to play some gambling, he begins to be so addicted, so passionate about it that the history never comes to one's mind. But if we reflect on this for a while, maybe we'll reveal some slot machine secrets and break the jackpot. Long time ago there was Charles Fey in San Francisco, who maybe wasn't an addicted gambler himself, but wanted to create something due to which we could receive money for our fortune. But it wasn't so easy to do that, afterwards this idea was always developed for the sake of our benefits. He had a curious task how to do all this in automatic way. Then in 1891 the Sittman and Pitt Company also wondered how to improve the slot games. At first it resembled much poker, because it had poker combination payouts. Instead of reels there were turning drums with fifty card faces. It was played most of all in the bars, cafes, but instead of receiving the cash, because it was forbidden in that time, the players used to receive different presents such as free beer, candies if they wanted. Also during the slot machines history along with Sittman and Pit, Fey also didn't lag behind and produced the first slot machine which is called The Liberty Bell. He didn't devise it till the end, but nevertheless the simpler pattern he introduced to the world in 1895. There were five symbols (besides, one of them was the liberty bell) and three reels. It wasn't automatic, thus the visitors had to pull the lever and to rely on their destiny. These eased winning combinations both for the gambler and the assistant, who, by the way had to bring the prize himself. This first machine is like the ancestor of the electromechanical machines that we have been playing till now. Charles Fey was a very smart man, and he didn't stop with his success of the Liberty Bell and joined with the Mills Novelty Company in order to increase the development of the slot machines, they weren't still done to the automatic way. In this way the bettered version was produced with the name of Mills Liberty Bell. It was an iron machine and the symbols of King, Queen and Jack were added and plus there was the bell that announced about the win of the player. Then it reached the other name - Operator Bell. The difference was that it had a gooseneck slot and plus the symbols of fruit. And moreover, after some period of time the company decided to lighten it a little bit and made it wooden. 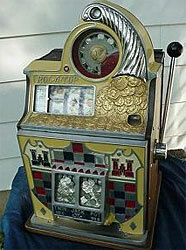 The popularity was enormous; everybody wanted to play slots machines. 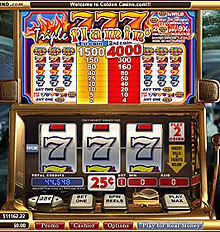 The pick of the popularity of the slot machines reached the 1950th, when people realized that it was possible to win the big amount of sum with putting one coin. The machine Big Bertha was the proof of this. The payouts were increasing; every bar, cafÃ© wanted to have this beast. Till this moment there were used the Fey patterns, but the machine Money Honey extended the development of slot machines to the electrical ones. During this time, the casinos received the most of its profits by locating such machines there. At the 1980th the gamblers had more options and possibilities to win. Almost everything was more comfortable, and more clearly. The gambler could put not only coins but also bills, cash in order to start the game. From this time the gamblers could console themselves playing only the slot machines because the chances and varieties were high. Comparing with the slot machines history, slot game is the main casino attraction nowadays, because it's simple and profitable. The machines use random numbers and a range of options. And due to its significance in the casinos, they couldn't help but introducing them into the online world, in order to have access to this adored game days and nights, and in different parts of the world. Different sites have varieties of the slots gambling online, you just must have the desire and as always the money. The prizes and the possibilities are much higher, because the software companies increase the development of these online games to the 100% every day. So, comfort, prizes, winnings, what is more desirable for the gamblers and just ordinary players? Just try it and you'll see!